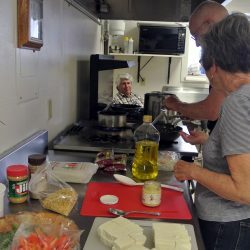 This weekend a group of us participated in cooking workshops at the Rodeo Community Center. We made bread, pizza dough (and pizzas! ), spring rolls, Asian dipping sauces, peanut noodle salad, pie crust, and quiches. Here are the recipes we used. Yum!